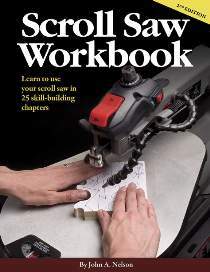 Want to really learn how to use your scroll saw? This is the book. Veteran teacher and scroll saw expert John Nelson has taught hundreds of students the ins and outs of using a scroll saw. This is the same workbook he uses in his 5 hour seminar. Here is our favorite part: In each of the 25 chapters you will learn one specific skill. You will practice that skill until you feel comfortable with it, and then you will make an attractive project using the specific skill you just learned. There is just no other book like it. Perfect for both beginning and experienced scrollers. Lots of color photos and full size patterns. 96 pages, 8-1/2" x 11", softcover.